Here are two of several Hemingray-20s for which I am not seeing the embossing index number in the price guide. 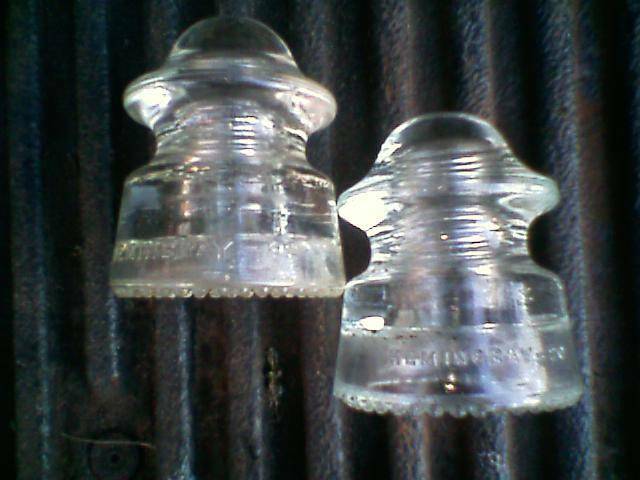 The insulators are embossed: (F-Skirt) HEMINGRAY-20 (R-Skirt) MADE IN U.S.A./[Numbers and dots] and all have round drip points. The closest EIN that I see is  which has the [Numbers and dots] on the front skirt rather than the rear. Maybe this is one of those which are not listed because it makes no difference in pricing but this seems much more different than a punctuation variation. I am the fool: these are CD 165s not CD 164s. I have also noted that the Hemingray name appears in two different sizes, see photo.